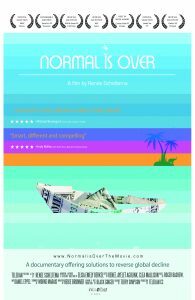 Nyenrode’s Alumni Circle for Sustainability proudly presented its first movie night on September 20, 2016, featuring the award-winning documentary film: Normal is Over. A diverse crowd of students, alumni as well as other sustainability enthusiasts and professionals came to Nyenrode to watch the film together. Having the filmmaker – Renée Scheltema – present at the screening made it extra special. Discussion followed on why and how to turn the movie into a movement. Before the film, Renée shared why and how she made the film. She wanted to make a documentary to tackle the big picture of what’s happening to the planet through an environmental lens. She wanted to find out whether our growth-based economic system is the root of our current crisis. And if so, why no one listened to the forecast by the Club of Rome? 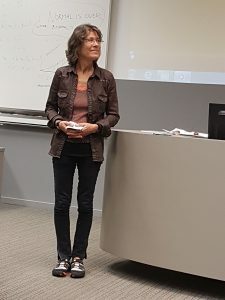 Only after an analysis of the problem, could she start to offer a comprehensive overview at ways in which activists and everyday citizens are making the world a better, greener, and more sustainable place. She set out to make this documentary this independently, as a one-woman crew. People laughed at her and wished her luck as they were not sure how successful this venture could be. She sought out advisers from her past, and they helped to get her started on what became a year-long journey around the world. During the trip she met and interviewed so-called keystone individuals making a difference, each in their own way. Some helped deepen her understanding of the issues, others shared impactful solutions that offer hope. After watching the film, Nyenrode professor Sustainable Business André Nijhof provided his perspective on the film. He was quite overwhelmed by the striking visualization of some of the issues. He linked back to his recent inaugural lecture, clarifying that he is not an optimist, yet hopeful. And that he was inspired by seeing that we are capable of finding solutions. An interesting discussion followed with the audience. Some shared how they were touched by the film, others had lots of questions on the road map for the future. Some even suggested the creation of a next film about the new normal. The discussion closed with a call to action to join the Normal is Over movement. The film and Renée will be embarking on a world tour soon. During the tour, Renée will also seek out local eco-communities to film them to share their solutions with others and to help them connect around the world. Companies like Patagonia and Nedbank have already committed to help spread the word and fund parts of the tour. This great quote comes towards the end of the film. If we all contribute to change, we can make a difference. The question was raised whether our small contributions would be enough, don’t we need systemic change instead? The discussion then progressed to reaching a tipping point, a critical mass of people aware and eager for change, together driving those who can make systemic change happen. André Nijhof’s final remarks provided some caution: you cannot wake a person who’s pretending to be asleep”. So it’s up to us to make the rest awake and aware that change is needed! Over drinks, the conversation continued for quite some time, connecting people from different generations and backgrounds over a desire to be part of this change. Curious about the movie? Please watch the trailer below, which includes a link to watch the full film online. Impressed after watching the movie and want to plan a screening or support the world tour? Please get in touch via info@normalisoverthemovie.com. 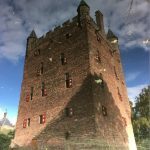 This post was originally written for Nyenrode Business University’s alumni website by Marjolein Baghuis (@mbaghuis). To read about interesting people, book reviews and other posts about sustainability, change and communications please subscribe to the Change in Context blog.